Certainly cause for celebration and satisfaction. Good news is a rare commodity these days. 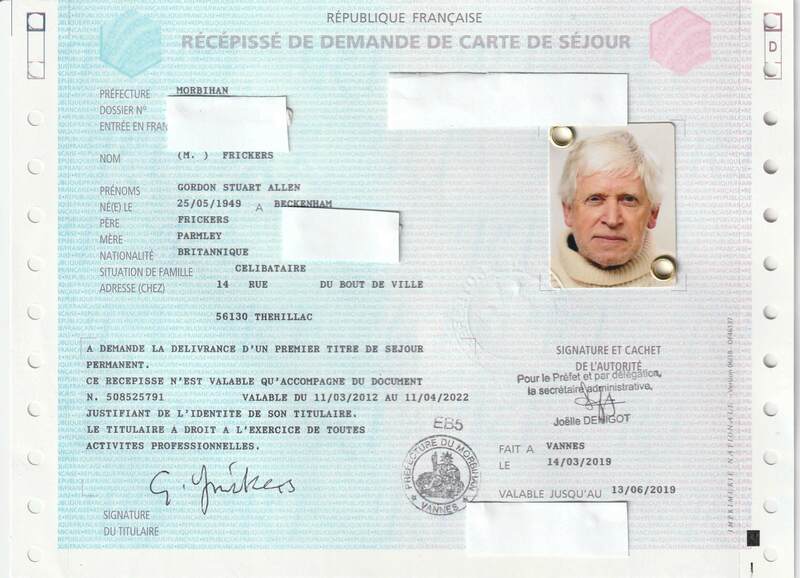 I have been given a Recepisse de Carte de Sejour Permenate. This makes me much more ‘Brexit proof’; meaning I’ll be painting more glorious French landscapes. I first tried for this back in 2012… successful this time, my third application. Merci bien, vive la France ! Given my circumstances are ‘unusual’ some lateral thinking was needed while keeping firmly in mind PPP=PPP; to create an unusual and successful solution. My very sincere thanks to my French & English friends who supported my application. In particular Tristan and Wayne, way above the call of duty. My suggestion of payment for their advice, guidance, practical help and tireless patience with my questions for their time and expertise, was politely refused at the BML anglo agence, QUEVERT BP 62033 22102 DINAN. As insurers I doubt you will find a more helpful team in all of France. Much as I love Britain and my British friends the simple facts show me Brexit makes my life harder, steals hard won funds from my pocket, wastes valuable, irreplaceable time. While the wallies of Westminster fiddle, Britain burns so I’ve chosen to get out of their fire. Do I love #Brexit? No, I think it’s it’s cowardly & backward besides which the E U needs Britain to fight for a more open, democratic and modern E U, to lead in creating a better future for us all.